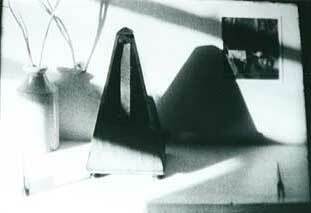 Guy Sherwin's subtle, acutely observed films are characterised by an enduring concern with light and time as the fundamentals of the medium. When film is projected, light shines through the celluloid and is subtly refracted by the grain, which, because it is different on every frame, drifts and swirls, forming and reforming the image. In film, each frame is presented one by one, at a rate of twenty four per second. The unique rhythmic pulse this creates is different from video, whose images are continuously decoded and then reconstituted. The sensitivity to these characteristics underpins Sherwin's approach to film making, but he is also motivated by a commitment to the photo-chemical reality of the film image: the existential connection between the real object which is filmed and its rendering as an image on light-sensitive material, a process distinct from the magnetic encoding of the digital image. He studied at Chelsea School of Art, where he made paintings that functioned as modifiers of shadows and light effects. The shadows they cast were as much the work as were the pictures themselves. This approach has fed through into film, which he began making in the 1970's, at the end of a period in which many artists abandoned painting and conventional sculpture to work in performance, land and body art, conceptualism, video and film. His early work included performances, such as Paper Landscape (1975-present) and Man with Mirror (1976-present) in which he interacts live with projected images of himself. Since 1975 he has also been producing the ongoing Short Film Series, some of which can be grouped according to content, and are discussed below. Sherwin has also made a number of medium length films such as Messages (1981-84), which explores the childs view of the world through questions posed by his young daughter, Under the Freeway (1995) shot under and around a motorway in San Francisco, and Filter Beds (1998), in which he pulls focus through multiple layers of foliage and passing aeroplanes reflected in the ponds of a derelict sewage works. He has also made a number of films in which the image produces the soundtrack. This is achieved by printing the former in the area reserved for the latter. Cycles 1 (1972-77) Musical Stairs (1977) Railings (1977) and Night Train (1979) all have such optical -photographic- sound tracks. In Railings Sherwin films along the bars of a park railing with the camera turned through ninety degrees, so that they appear in the soundtrack as closely-packed horizontal lines, which generate a buzzing sound that varies according to the movements of the camera. Even when the image is static, the individual frames continue to pass constantly over the sound replay head, so that while the image stops and starts the sound is continuous. In this way the difference between the intermittent picture reproduction and the continuousness of sound is highlighted. When screened, the projector is turned on its side so that the image appears right way up.